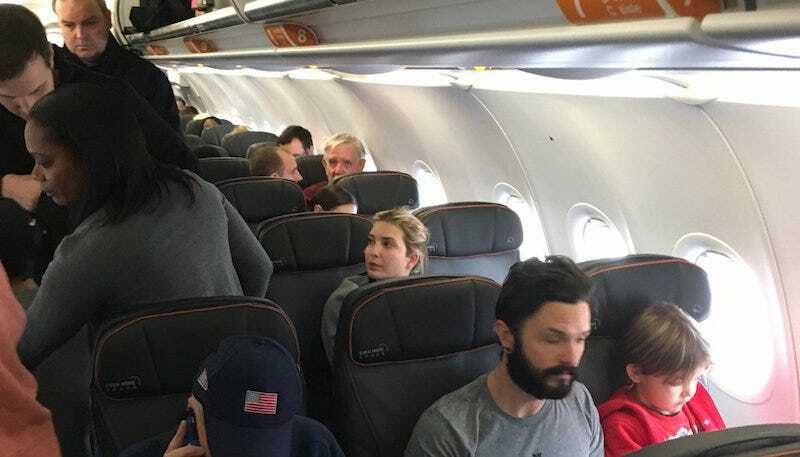 This morning a man was kicked off a JetBlue flight after confronting Ivanka Trump, who was reportedly flying coach with her “family and a bunch of cousins” in what was either a photo opp, an emergency, or Kellyanne Conway’s last act of revenge. In a now-deleted tweet, Hunter College professor Matthew Lasner wrote of chasing down Ivanka and her husband, Jared Kushner, after spotting them in JFK’s Terminal 5. Lasner and his husband and Ivanka and Jared were all apparently booked on the same JetBlue flight, where TMZ reports Lasner’s husband—referred to as an “unruly passenger,”—began heckling them. “Your father is ruining the country.” The guy went on, “Why is she on our flight. She should be flying private.” The guy had his kid in his arms as he went on the tirade. Given Donald Trump’s unabashed love of heckling people in front of a crowd—he singled out NBC reporter Katy Tur so many times she had to get Secret Service protection—I’m just surprised the administration didn’t give Lasner’s husband a cabinet seat right then and there. “My assessment of tone is that she meant to just let it blow over,” he said, before jokingly offering to pass the phone to Ivanka to answer further questions. I accepted the offer, but he demurred.